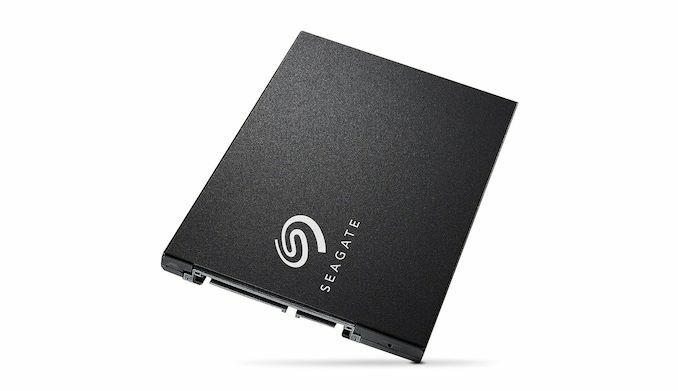 Earlier this year, Seagate re-entered the consumer SSD market with their BarraCuda SATA SSD. It's been over five years since we last reviewed a Seagate consumer SSD, so for all practical purposes this is a fresh start for the company. Seagate has been one of the top names in the storage industry for decades, but it's almost exclusively for their hard drives. The company has been largely absent from the consumer SSD market, and their enterprise SSDs have never particularly stood out above the competition. By comparison, rival Western Digital managed to acquire SanDisk and with it a 50% stake in one of the largest NAND flash manufacturers. Seagate's acquisitions have been less fruitful: they bought controller designer SandForce right around when SandForce drives disappeared from the market for good. Since then, Seagate has had to buy controllers and NAND on the open market and provide product differentiation through firmware or by integrating their drives into storage appliances. The Seagate BarraCuda is not a revolutionary new SSD. It doesn't mark the release of a new SandForce controller but instead uses the very familiar and rather old Phison S10 controller. The flash is Toshiba's 64-layer 3D TLC NAND. Toshiba for their past has technically already started shipping their 96-layer TLC, but most of their production is still 64L and the 96L NAND hasn't made it into any retail SSDs yet, so the BarraCuda is up to date on the NAND choice. This is the first drive we've tested that pairs the Phison S10 controller with 3D NAND. We first reviewed this controller in 2014, so it has had an incredibly long lifespan for such a product. With the SATA interface no longer getting speed increases, the Phison S10 isn't as obviously outclassed as such an old controller would otherwise be. It's showing its age a bit with the lack of LDPC error correction or (LP)DDR4 support, but it has proven to be an adaptable chip, supporting several generations of planar NAND and staying relevant today with support for 3D NAND. It also supports SSD capacities of up to 2TB, which was extremely implausible for a consumer drive with the flash prices in 2014, but which are now available for less than $300. The specifications for the Seagate BarraCuda look about the same as any other mainstream SATA SSD these days: TLC NAND, sequential I/O performance that mostly saturates the SATA link, and random I/O performance at up to 90k IOPS. But real-world performance depends more on performance at low queue depths and on mixed workloads, not peak numbers at QD32. This is where newer SSD controllers may have an edge over the Phison S10. The BarraCuda is rated for a little under 0.3 drive writes per day over the duration of its 5-year warranty. We can be pretty sure that the controller can keep going that long because our earliest Phison S10 drives closing in on that age without problems. However, without the benefit of LDPC error correction, Seagate's write endurance rating isn't as conservative as the 0.3 DWPD we see on its competition. The Seagate BarraCuda actually uses a controller chip bearing Seagate's logo and part number, but we've seen this same basic board layout many times and in many colors. Seagate is hardly the only company that rebrands off the shelf controllers. The Phison S10 is an 8-channel controller so we get 8 NAND packages, with two 256Gb dies in each package. The metal case for the drive is the same that we're used to seeing on Phison S10 drives, but with yet another variation on the paint job. The main competitors for the Seagate BarraCuda are mainstream SATA drives like the Crucial MX500, Samsung 860 EVO, Intel 545s, and WD Blue/SanDisk Ultra 3D. These all feature 64-layer 3D NAND but more recent SSD controllers. 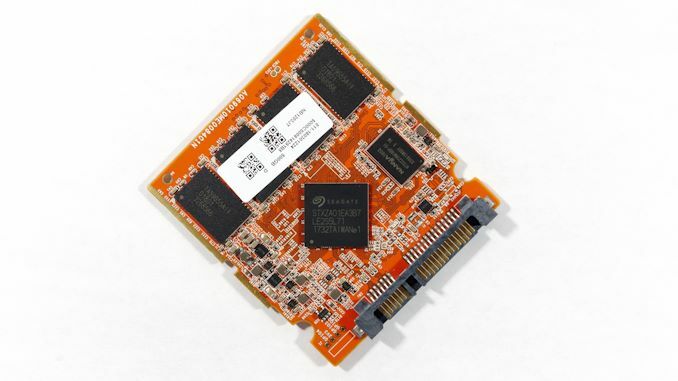 For this review we've also included a pair of current-generation DRAMless SATA SSDs: the Mushkin Source and the Toshiba TR200, the latter of which uses the same NAND as the BarraCuda but Phison's S11 4-channel entry-level SATA SSD controller. We've also thrown in results for some older drives that used the Phison S10 controller with planar NAND: the Toshiba OCZ Trion 150 with 15nm TLC, and the PNY CS2211 with 15nm MLC. Perhaps the most interesting point of comparison is the Plextor M8V, a drive that's generally hard to find for sale, but is very useful here because it uses the same Toshiba 3D TLC NAND but pairs it with the Silicon Motion SM2258 controller instead of the Phison S10. This helps identify which performance differences are due to the choice of NAND and which are controller or firmware bottlenecks. Fantastic review as always. Thanks for your hard work. The problem for Samsung's consumer market is they've been making drives that max out the capabilities of SATA for 5 years. There just isn't much more room to improve. And the problem for Samsung's prosumer market is the WD Black NVMe is an overall better value than the 970 NVMe, ESPECIALLY in mobile where the 970's (even the EVO) are so power hungry they constantly throttle in laptops, while reducing battery life. I used to think that SATA is dumb for recent SSDs. However, I noticed that it is only for sequential workloads which can be left running in the background. SATA still has a lot of life for SSDs. The 2.5" form factor is still dumb though. It is huge waste of space and materials. The reason this was done was to safe on space knowing that eventually they would deployed in laptops.